Glucose is the main source of energy for living beings. It is naturally occurring in fruits and other plants. In animals, it is brought about by the process called glycogenolysis, which is what the breakdown of glycogen is called. In the liver and kidneys, glucose is synthesized from non-carbohydrate intermediaries, such as glycerol and pyruvate, during a process called gluconeogenesis. Glucose, which is sometimes called dextrose or grape sugar, is a simple sugar or monosaccharide, which belongs to the group of simple carbohydrates. It has a net carbohydrate content of 100 percent, 3.8 calories per gram, and a glycemic index of 100. Glucose formula is C6H12O6. Glucose is a precursor of deoxyribose, fructose, galactose, and ribose (in DNA and RNA chromosomes); proteins, lipids, galactosamine, glucosamine, glucuronic acid (in the cartilage); and other substances that are necessary for the optimal functioning of the body’s organs, cells, and tissues. Glucose is a non-essential nutrient as it can be manufactured in the body. 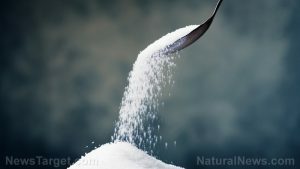 There is no need to consume glucose or other glucose-containing carbohydrates, such as starch or sucrose, to keep healthy blood glucose levels, as long as you get enough other nutrients from which glucose can be produced in your body: proteins, fats, fructose, galactose, or sugar alcohols, such as sorbitol or xylitol. Glucose is absorbed in the jejunum (the middle part of the small intestine) via the aid of transport molecules SGLT1 (the sodium-dependent glucose-galactose transporter) and GLUT2 transporters, and in the ileum (the last part of the small intestine) and colon via the help of GLUT7 transporters. When glucose is absorbed into the body from the intestine into the blood, it stimulates the release of the hormone insulin – which makes it possible for glucose to enter the muscles and fatty cells – from the pancreas. Once inside the cells, glucose can be broken down to release energy by two ways: during rest and moderate exercise and during intense exercise. Subjecting yourself to less than 100 grams of glucose per day will force your body to produce glucose from glycogen stores in your liver and muscles and later on from the protein and fat that you ingest. If you stop eating, some fats from your body stores will be converted to glucose and ketones, which will be used to power your body, including your brain. This activity will make ketone a presence in your blood – a process called ketosis – and will cause you to have a foul-smelling odor to your breath and urine. If you starve for a long time, when your body fat stores have all been used up, the proteins from your muscles will start to break down. Foods with really high glucose content include soya drinks, apricots, carbonated beverages, chocolate, sports drinks, honey, tomato puree, watermelon, onion, and blackstrap molasses, among others. During digestion, glucose is released by foods that contain glycogen, dextrin, lactose, maltodextrin, maltose, starch, sucrose, and trehalose. These include potatoes, oatmeal, yogurt, barley, beans, beer, bread, cake, chestnuts, chickpeas, lentils, milk, peanuts, peas, rice, spaghetti, sunflower seeds, table sugar, and wine. Glucose can also be found in cereals, legumes, nuts, seeds, and vegetables. It is also available as corn sugar or as “energy tablets”. Factors that stimulate gastric emptying and thus glucose absorption include medical conditions such as low blood glucose levels (hypoglycemia), obesity, and diabetes mellitus type-1 and type-2; long-term drug use of orlistat, thyroid hormones, azithromycin, cannabis, cimetidine, clarithromycin, and erithromycin. On the other hand, the factors that slow gastric emptying and thus glucose absorption include the ingestion of decaffeinated coffee, proteins, long-term low-carbohydrate diet, fats, and viscous soluble fiber (beta-glucan in oats, or guar gum); and medical conditions that include hypothermia, stomach distension after binge eating, fever, functional dyspepsia, head or neck spinal cord injury, infections, nausea and pain including migraine, and severe trauma. Glucose has anti-cancer properties. Studies show that patients with acute myelogenous leukemia, which is cancer of the white blood cells, benefit from ingesting glucose. It is also used to treat hyperlipidemia, which is the presence of abnormally high levels of lipids or lipoproteins in the blood. Glucose is good for the digestive system. Glucose, along with fructose, can prevent bloating or loose stools. Glucose is good for the nervous system. Studies show that the ingestion of 50 grams of glucose before memory tests boosted short-term memory and attention in children, healthy adults, and in older persons with senile dementia. Glucose control, its not just for diabetics anymore! Glucose is good for the digestive and nervous systems. Glucose is a non-essential nutrient as it can be manufactured in the body.